All of the various streams of the NIV tradition include a similar statement about it being “new life” (NIrV, TNIV, NIV2011). * And yet the vast majority of other English translations and paraphrases (ESV, HCSB, LEB, LB, MSG, NAB, NASB, NET, NKJV, NLT, NRSV, RSV) which I checked all say “this life” which actually follows the Greek of the verse as noted in the bold: “λαλεῖτε…τῷ λαῷ πάντα τὰ ῥήματα τῆς ζωῆς ταύτης” (UBS4/NA28). I wondered if I had in fact missed something in the footnotes (either of one of the English versions or of my Greek text for variant readings) that would clarify this issue. Nothing. So I’m putting out a request (since I can’t find discussion of this in any of my commentaries ready at hand) to see if anyone knows where “new” in this context enters for the translation teams responsible for its inclusion? * The CEB, CEV, NCV and NJB also curiously include “new” before “life”. I mention these because the various groups of translators responsible for the NIV tradition are not the same as these others and yet arrived at the same curious translation. DISCLAIMER: I regard the NIV as a very reliable translation tradition. This post in no way is intended to denigrate either the translators or their work for which I have high regard. Today is Pentecost Sunday and I was asked to cover the adult Sunday School class since our normal teacher was gone. I, of course, knew what the content would cover and did not really prepare as I usually do. Instead, we discussed the passages from the lesson (Acts 8, 10-11, 19) and what it means for the Spirit to be poured out on the Samaritans who had professed faith in Christ, the Gentiles who were “God-fearers” and were only afterward baptized into the name of Christ, and the Ephesian disciples of John the baptizer who received the baptism of the Spirit at the hands of the apostle Paul. As we discussed these passages, I was struck by the presence and work of the Spirit throughout the world among all people. 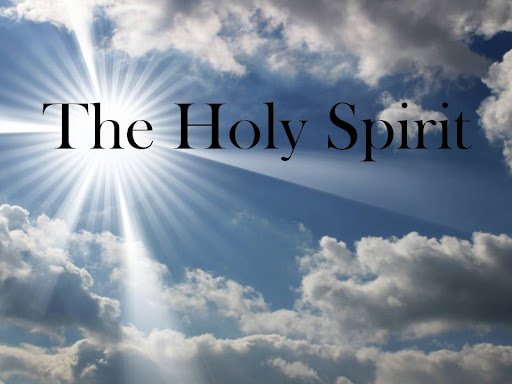 We discussed that it was God’s Spirit no longer remaining with the antediluvians in the days of Noah, and God’s indwelling Spirit which sanctified David. It was also God’s Spirit in the unborn John son of Zacharias and Elizabeth that gave testimony to Mary the mother of our Lord. That same Spirit was present and at work even as the teachers of the Law accused Jesus of casting out unclean spirits by the power of the evil one. Through this conversation, I confessed to my congregation that indeed we are simply partners with the Spirit who is present and always has been. It is about our relationship (read: yielded, obedient, etc.) with the Spirit that affects in what manner we speak of the Spirit being present. We join the Spirit’s already ongoing work. This is why I can affirm that any of us are ever drawn to salvation, because the Spirit is at work even while and where the Church is not. However, at the feast of Pentecost, the Church discovers this new-found relationship to the Spirit that drives them to live as the Spirit lives…as those who carry the good news of Christ Jesus come into the world by the Father, crucified, died, buried…raised to life and ascended to the right hand of God. It is a new day for the disciples of Jesus who have now discovered in the Spirit another “advocate” (a term notably difficult to translate from the Greek) who is like Jesus and reveals Jesus in and through them to a waiting world…a world where the Spirit is already at work to redeem and restore. This is the Spirit in the world (to be fair…I probably should check out Karl Rahner’s book by the same name). So I was wondering what your thoughts on the presence and activity of the Spirit in the world might be? Or is the Spirit only present in the Church in your way of reading the Scripture? The CAPITAL ITALICS are for picture representations of the respective section. Each section also has a selective Scripture portion as representative. I taught this over two weeks to our youth following the four weeks through the OT for Seventh Graders HERE, HERE, HERE and HERE. We, as well, cannot simply treat the Scriptures as a comprehensive list (or we may end up being no different than some of the Pharisees of Jesus’ own day–unless we take the New Pauline Perspective on the Pharisees as genuine) of do’s and don’t’s. In every age we are called to listen to the voice of the Spirit which is the voice of the Lord Jesus speaking to His Church the very words of his Father. None of this is to suggest that there will be any discord between what God has spoken, is speaking and will speak. The Scriptures are our measure, but the Scriptures are not simply words that can be adopted apart from the working of the Holy Spirit within us. This means that in all of our hearing, we must press in to hear exactly what the Spirit is saying and once we have heard…to obey. 33:1-6 – The choosing of a watchman. Who is the one who will bring “a sword”? What are the duties of a watchman? What are the consequences for the watchman and the people if the watchman gives warning? What are the consequences if he fails to give warning? What does it mean to be “taken away” because of sin? What does it mean to be “accountable for his blood”? 33:7-9 – Who has been chosen as the watchman of Israel and who has chosen him? What is Ezekiel’s responsibility toward those who are “wicked”? On the “watchman” motif for the prophet who gives warning: see Isa. 21:6-9; Jer. 6:17; Eze. 3:16-21; Hab. 2:1. 33:10-11 – What were some of Israel saying while in captivity? What is the basis upon which the LORD promises that they shall “live” though they feel the crushing burden of their sins weighing upon them? Does the LORD take pleasure in the death of the wicked? What is the call to the wicked? 33:12-16 – Are the wicked and righteous locked into their respective consequences? What is necessary to live? Is the promise of the LORD to the wicked that they “will surely die” a lie or a conditional promise? In what practical ways can the wicked indeed to what is righteous and be guaranteed life? Will sins committed be remembered if righteousness replaces wickedness? 33:17-20 – Are the ways of the LORD just? What would it mean for us to be just and what does it mean for the LORD to be just? According to what standard will the LORD judge Israel? 33:21-22 – The first survivor (Heb. pālît) of the destruction of Jerusalem arrives in Babylon as confirmation of the word of the LORD and of the prophet-hood of Ezekiel (cf. Eze. 24:25-27). The date notice refers to January 8, 585 BC. This places the following passage approximately five and a half months after the fall of Jerusalem (which is about the proper amount of time for travel between Babylon and Jerusalem). Note that prior to the survivor’s arrival the “hand of the LORD” was on Ezekiel to open his mouth. What does it mean that his mouth was opened after ten years? It seems to mean that he was released from the prophetic silence and could actually cry out to the LORD on behalf of his people since the city and the temple were finally destroyed as prophesied. 33:23-33 – Those remaining in the ruined land of Israel still clung to the promise as if it did not matter how they responded to the covenant. Were they safe to assume for themselves the promises to Abraham? What does the LORD accuse them of? What will be the actual consequences of their lifestyles? What is the stated purpose of the LORD in further destroying the land and making it desolate? Note that the LORD regularly says “your countrymen” to Ezekiel. What is the significance of this? Who (besides those actually still in Israel) are accused of practicing wickedness despite their outward attentiveness to the word of the LORD given by Ezekiel? What does it mean that to those in captivity Ezekiel is “nothing more than one who sings love songs”? What will be the vindication of the ministry of Ezekiel? 34:1-10 – A prophecy against the shepherds of Israel. How did the shepherds fail to care for the flock? Isn’t the shepherd allowed to eat from the produce of his flock and does not the flock exist for him? What would be the reason for the LORD accusing the shepherds in this manner? (cf. Gen. 31: 38-40; Job 5:23; Isa. 11:6-9; Jer. 23:1-6; Hos. 2:18-23; also concerning the “shepherds” of the Church see Acts 20:28-29; 1 Pet. 5:1-5) What is the consequence of their failures—both to the flock and to the shepherds? Who are the “shepherds” of Israel? Who is against the shepherds and who actually owns the flock? 34:11-24 – The LORD Himself promises to care for His sheep (cf. Ps. 23; Eze. 24:26; John 10:1-18; Rev. 7:17). What does it mean for the LORD to gather His sheep? In what manner does the LORD promise to shepherd His sheep and also what is the promise concerning the actual land of Israel? Note that the LORD will judge among his flock and deal with those among them who have cared only for themselves and even troubled the lives of others. Who are those among the flock that the LORD is referring to here as opposed to the shepherds that were accused earlier of selfish living? Who will be placed over the LORD’s flock as a shepherd? What does it mean for “David” to be chosen for this position (since David had been dead for several hundred years? “God’s solution to a history of bad shepherds is not to replace shepherding with a better system, but to replace the bad shepherds with a good shepherd” (Duguid NIVAC 396; and Duguid Ezekiel and the Leaders of Israel 47). 34:25-31 – The LORD will make a “covenant of peace” with His people. What are the promises of this covenant of peace? Security, fruitfulness, freedom, and intimate covenantal knowledge of the LORD are all part of the promise. What does it mean for the LORD to be their God and them to be His people, the sheep of His pasture? “What does it mean to be a shepherd? It is a unique combination of afflicting the comfortable and comforting the afflicted” (Duguid NIVAC 399). Iain M. Duguid, Ezekiel and the Leaders of Israel (Leiden: E. J. Brill, 1994). 26:1-6 – The date given (while presenting textual difficulties) suggests Feb. 3, 585 BC (Block NICOT II:35). This would place this prophecy at about the very time that Nebuchadnezzar began his thirteen year siege of Tyre and just one month after the notice of Jerusalem’s fall would have reached the Babylonian exiles. What is the reason stated for the judgment of Tyre? (26:2) Note that the descriptions which follow of Tyre being in the midst of the sea (and also the metaphor of Tyre the merchandising ship that sinks) pictures the island capital that sat just off the coast of modern Lebanon. It was an amazing island fortress that would not actually be taken by force until 332BC by Alexander the Great (and even then only by great cost and building a land-bridge to the island to conquer it). Iaian Duguid notes the prophetic irony of Tyre’s self-seeking and self-promoting ways and their results when he writes, “Does Tyre hope to become the new meeting place for the nations? The Lord will bring many nations against her (26:3). Did Tyre rejoice to see Jerusalem’s doors shattered? Her walls will be destroyed and her towers torn down (26:4). Did Tyre expect to prosper? She will become plunder for the nations (26:5)” (NIVAC 334). What is the stated purpose for the judgment? 26:7-14 – The description of the destruction at the hands Nebuchadnezzar offers explanation for the analogy that was in the previous verses. What effect does Nebuchadnezzar being called the “king of kings” have in relation to this prophecy? What significance might be suggested by the silencing of the sounds of the city in verse 13? How should we understand the absoluteness of the prophecy of Tyre’s destruction in verse 14? 26:15-18 – A brief statement about the reaction of the nations who had benefited from Tyre’s glory days. The rulers will leave their thrones and royal garments in terror and trembling at the destruction and raise a lament (Heb. qinah). Tyre seems to be the basis for the descriptions of “Babylon” in Rev. 17:1; 18:9, 12-13, 17. 26:19-21 – The end of Tyre will be destruction. Tyre is described as descending to the “pit” (that is to death and the grave; on the “land” of the dead cf. Ps. 22:29; Isa. 26:19; Jonah 2:2, 6; Ugaritic texts: CTA 4.8.5-14; 10:2.24-25) where there will never be a recovery (cf. Eze. 27:36; 28:19). How might this be fulfilled? 27:1-36 – A further lament over Tyre. Tyre is described as “perfect in beauty” because of the great splendor she has been adorned by. Ezekiel uses the metaphor of Tyre as a great mercantile vessel that was manufactured of exquisite materials and staffed by the finest of merchants and sailors. A description of the many lands and wares of Tyre’s trading are laid out in great detail in order to emphasis the greatness of Tyre’s wealth and power. The Mediterranean nations from furthest west, to the Anatolian, Levant, and Arabian kingdoms as well as Mesopotamian lands are named with all their particular wares. The LORD declares though that the ship of Tyre will sink to rise no more. The terror of Tyre’s “sinking” will strike all the nations that had traded with her. 28:1-10 – A prophecy against the ruler (Heb. nagid; and see also the “king”or melek in verse 12) of Tyre. The ruler that was on the throne of Tyre at that time was Ethbaal III (591-573 BC). The ruler declared himself to be “a god”, but the LORD reminds him that he is nothing more than “a man” despite his unparalleled wisdom and wealth (cf. the praise of Herod as “a god” by the Tyrians and Sidonians and his judgment in Acts 12:22). The ruler had become arrogant and self-congratulatory instead of recognizing his dependency upon the LORD. 28:11-19 – The king of Tyre (which appears to simply be another designation for the ruler mentioned in verses 1-11). Who does this prophecy refer to? It seems mistaken to make the metaphor of the king being a “guardian cherub” created in “perfection” (and on blameless in your ways” see Gen. 6:9; 17:1) adorned in many precious stones (which though lacking three specifically are those found in the Israelite High Priest’s chest-piece in Ex. 28:17-20; 39:10-13 though Daniel Block NICOT II:110-2 rejects the specific priestly connection) and living in “Eden” (which is later also applied to Pharaoh in Eze. 31:8-9) to be a reference to Satan. Ezekiel is certainly using the language of Genesis 1-3, but it seems to be more for rhetorical effect to demonstrate the heights of glory and blessing that the king of Tyre has lost through pride and greed. What will be the end of the king? 28:20-23 – A prophecy against Sidon. Sidon (which is north of Tyre along the coast) and Tyre struggled for much of their history against one another and at varying times controlled one another. “Sidon” was in fact the generic name for “Phoenicians” that was used throughout the Mediterranean region though in this case it would possibly refer to the actual city of Sidon. There is no specific accusation made against Sidon, but only judgment promised. What is the intention of the judgments? 28:24-26 – Hope for Israel. The LORD promises to remove all of Israel’s troubling neighbors that are “painful briars and sharp thorns” (cf. Eze. 2:6). The LORD Himself will gather His people from among the nations and return them to the land of His covenant with Jacob. What relation do the people and the land share? What is the intended goal of the restoration of Israel? 2:1 – Why should Ezekiel have to stand in order to listen to the LORD? It would seem to be because his calling is to action. Why is he called “son of man” (ben ‘adam)? It is to emphasize his humanity in the presence of the glory of the LORD. Also, it must be noted that Ezekiel in this instance is enabled to do what he does (stand, speak, not speak, go, etc.) only by the Spirit, which places him in relation to the “living creatures” of chapter one. What relation does this have in regard to the relationship between the Spirit and the person filled with the Spirit? Are we to regard those with the Spirit as automatons or is there any sense of participation/rebellion against the Spirit? 2:5 – The “rebellious” acts of Israel are comparable to the rebellious child of Deut.21:18-21. Why should it matter that a real “prophet” was among them and what does this mean? 2:6 – “Don’t be afraid” – Why should Ezekiel be afraid and why not? The “briars, thorns and scorpions” may actually not refer to Israel, but to divine protection from Israel (see Jer.15:19-21; Block NICOT 121-122). 2:8-10 – “Open your mouth and eat what I give you”? (see Acts 10) He is given a scroll with writing on both sides? What is the significance of both the eating of the scroll and the writing on both sides as well as what is written? Iain Duguid (NIVAC 69-70, 79) has compared and contrasted Adam with the “son of adam” – Ezekiel (set in further contrast to the rebellious “sons of Israel”). He included such things as: the “breath of life” (Gen.2:7) versus the “spirit” (Eze.2:2; 3:12, 14, 24); the test of obedience (Gen.2:17; Eze.2:8); the contrast of what is eaten between the fruit that is considered “good for food, pleasing to the eye and desirable for gaining wisdom” but leads to judgment (Gen.2:17; 3:6) versus what a scroll covered on both sides with writings of lament, mourning and woe but which may lead to life (Eze.2:10); and finally in both cases disobedience to the command of the LORD concerning eating will result in certain death (Gen.2:17; Eze.3:18). 3:1-3 – Ezekiel eats the scroll. What is the significance of it being sweet? (Psalm 19:10; 119:103; Rev.10:9-10) Also, why should Ezekiel make sure to fill his belly with the scroll? 3:5-6 – It is a shocking thing to note that foreigners (i.e., Gentiles) would have listened to the word of the LORD through Ezekiel as opposed to Israel (see Matt.11:20-24). 3:8-9 – Why would (or should) the LORD “harden” Ezekiel? (note the word-play with his name which means “God hardens”) “The message of God’s spokespersons derives not from private reasoning or logic, or from mystical reflection, but from revelation” (Block NICOT 131). 3:14-15 – What is the prophet’s attitude? Compare his response to Jeremiah 15:17. 3:16-21 – This pronouncement to Ezekiel has the elements of a legal pronouncement, however this message is specifically only for Ezekiel to be reminded of the seriousness of his call to prophecy to Israel no matter what their response will be (see Eze.33; Block NICOT 142-143). Who is the ‘enemy’ Ezekiel as the “watchman” must warn Israel about? Concerning the prophetic “watchman” see Hos.9:8; Jer.6:17; Heb.10:31. 3:18-21 – What constitutes someone being referred to as either “evil” or “righteous” in this context? The basis of judgment is the issue of faithfulness to the covenant (Deut.24:13 – where Torah obedience means “righteousness”). 3:26 – Why would the LORD not allow Ezekiel to speak after giving him a message? The NIV reads “to rebuke” where the Hebrew (’ish mokiah) reads literally “an arbitrating man” (Block NICOT 159; Duguid NIVAC 80); thus implying there can be no intercession for Israel (which is one of the roles of a prophet – see Gen.20:7 concerning Abraham – and priest). What does this say of judgment and mercy in regard to Israel? 2 Kings 22-23:30 – Josiah – Is There Still Hope? 22:1 – Josiah – son of Amon. He reigned for 31 years (640-609BC) over Judah doing what was right in the sight of the LORD as David had done – he was the ideal king (Deut.17:20) and fulfilled the prophecy given by the unnamed prophet of Judah (1 Ki.13:2). He became king while only 8 years old. The Babylonians with the Medes found freedom from Assyria at the death of Ashurbanipal in 626BC. They conquered the Assyrian capital of Ninevah in 612 and finally destroyed the Assyrians in 609. When Josiah turned 16 (in 632BC) he began to make certain religious reforms in Judah (2 Chron.34:3). In his 12th year as king (at age 20 – or 628BC), he began removing idolatry from Judah (2 Chron.34:3). His 18th year as king of Judah (age 26 and year 622) led to the repairs and restoration of the Temple of the LORD (2 Ki.22:3; 2 Chron.34:8). Hilkiah the High Priest oversaw the repairs of the Temple and “found” the “Book of the Law” (2 Ki.22:8; apparently it had been removed from beside the Ark of the Covenant – Deut.31:26) which after being read was then read in the presence of King Josiah (2 Ki.22:10). When Josiah heard the “Book of the Law” he tore his robes in repentance and sent his administration to Huldah the prophetess to inquire of the LORD concerning the Law. In response to the message of impending judgment given by Huldah, Josiah initiated full-fledged reform in Judah and even Israel. He called all the people, the priests, and the prophets (this last one is not found in 2 Chron.34:30) together to hear the reading of the Book of the Covenant (and thereby renew the Covenant – Deut.31:9-13), and to cleanse the land and the Temple, and to celebrate the Passover in an unprecedented scale (2 Ki.23:21). In his reforms, he had the aid of the writing prophets: Jeremiah, Nahum, Habakkuk and Zephaniah. In 609BC, Pharaoh Neco of Egypt on his way to the Euphrates to engage the Babylonians (as ally or enemy? ), Josiah challenged him to fight at Megiddo. Neco declared that God had sent him and that Josiah should not fight, but Josiah attempted to disguise himself and was shot with an arrow. He was returned to Jerusalem where he died and was buried. 22:8 – What “Book of the Law (22:8) / Covenant (23:2)” was “found”? Many believe it was at least a portion of Deuteronomy if not the whole book or even possibly the whole Torah. How is it possible that it should be “found”? 22:14 – Huldah the Prophetess? She appears to have been a relative (his aunt?) of Jeremiah (Jer.32:7). Huldah was not the only prophetess known to Israel/Judah – see Miriam in Exodus 15:20; and Deborah in Judges 4:4). The prophet Joel (2:23) would later declare by the word of the LORD that the Spirit would be poured out on all persons irregardless of gender, age, or status; and Peter on the Day of Pentecost would declare that the prophecy of Joel was fulfilled in the Baptism in the Spirit (Acts 2:14-21). What do we make of the contents of Huldah’s prophecy (see Deut.28:15-68). 22:20 – How could he be “buried in peace” in light of his violent end in 1 Ki.23:29? 23:3 – The pledge of the covenant is comprehensive. It involves heart and soul to all of the commandments, regulations and decrees and involves everyone (much as the renewal in Josh.24:1-27). 23:4-25 – Josiah’s Reforms: removed and destroyed all the utensils in the Temple of the LORD used to worship other gods; removed the pagan priests from the Temple; burned the Asherah pole Manasseh had put in the Temple; destroyed the quarters used by the male shrine prostitutes and the women who made clothes for Ashtoreth; desecrated all the high places in all of Judah; broke down the shrines at the gates of Jerusalem; desecrated Topheth where children had been offered to Molech; removed the horses dedicated to the sun and destroyed the accompanying chariots; removed the altars for astral deities installed by Manasseh and Ahaz; destroyed and desecrated the high places Solomon had built for his many foreign wives (see 1 Ki.11:7); destroyed and desecrated the high places and altars in Israel set up by Jeroboam in Bethel (see 1 Ki.12:25-13:5); removed the spiritists and mediums in Judah (see Lev.19:31; 20:27; Deut.18:11); removed the idols and tools for divination; and slaughtered the priests in Israel (see Ex.22:20; Deut.13:6-11; 18:20). He also commanded Judah (and Israel) to “celebrate the Passover” (see Ex.12:1-11; Deut.16:1-8). 23:13 – The “mount of corruption” (har hammashith;) is a Hebrew play on words with the name of the “mount of anointing (‘olives’)” (har hammisha) – (Konkel NIVAC 637). 23:22 – What made this Passover celebration so utterly unique? What would be the difference between the Passover celebrated by Hezekiah (2 Chron.30:1-27) and this one (2 Chron.35:18)? According to 1 Esdras (1:1-20) and Josephus (Ant.10.70-72) it was the sheer volume of sacrifices and the scope of uniting Israel and Judah in this celebration. 23:25 – What does it mean for Josiah to turn to the LORD with his whole “heart”, “soul”, and “strength”? (see Deut.6:4-5) Why should this be followed by a “nevertheless” concerning the judgment of the LORD (2 Ki.23:26)? Also, why would the LORD reject the place he has chosen and what is the significance of removing His Name from there (23:27)? 23:29-30 – Why did Josiah go to fight Neco of Egypt given the message to do otherwise by God (compare 2 Chron.35:20-25)? Also, why did he wear a disguise (compare Ahab in 1 Ki.22:30)? This was considered such a national tragedy that Jeremiah is reputed to have penned a lasting lament to be sung annually in memoriam (2 Chron.35:25). According to 1 Esdras 1:28, Jeremiah had warned Josiah not to fight against Neco, and according to Josephus (Ant.10.76) “fate” drove him that Judah might be judged by the LORD. Author Rick WadholmPosted on December 23, 2009 Categories 1 Esdras, 1 Kings, 2 Chronicles, 2 Kings, Acts, Deuteronomy, Exodus, Hezekiah, Joel, Josephus, Joshua, Josiah, Judges, Leviticus, NecoLeave a comment on 2 Kings 22-23:30 – Josiah – Is There Still Hope?